A rare old Brora from the last year of production before it closed permanently in 1983. 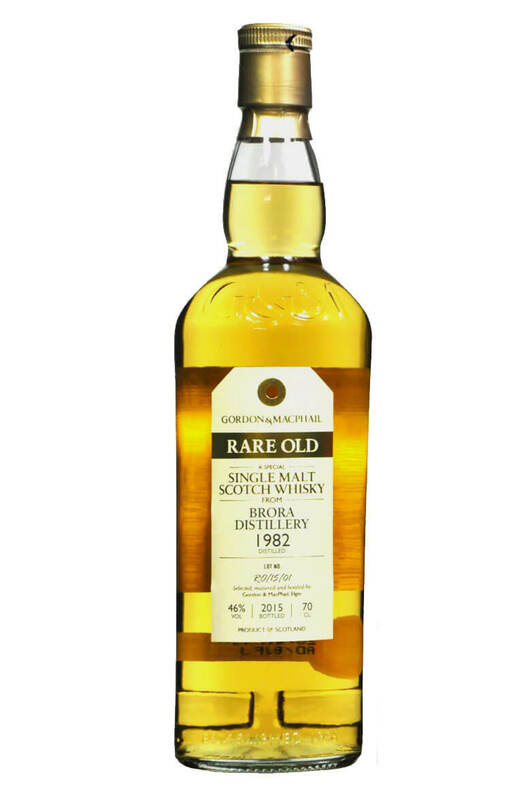 The 1980's Brora malts where produced in a less peated style than those of the 1970s. This was matured in a refill sherry cask and has some lovely fruity, spice and gentle smoke flavours. Aromas (with water) Subtle vanilla with fresh green apple, pear and orange notes complemented by hints of Parma violets. Aromas (without water) Fragrant green apple aromas enhanced with lemon and lime and subtle menthol notes. A sweetness develops with hints of milk chocolate. Palate (with water) Peppery with hints of banana, dark chocolate and orange zest. An undertone of dried tobacco is present. Palate (without water) White pepper, ripe banana, blueberry and cardamom spice flavours which are complemented by an underlying peat smoke edge. A delicate yet complex single malt that has some coastal character and just a faint touch of peat..
Part of Diageo's Distiller's Edition range, this particular release has been finished in dry..